Comet 204331A (A-DF) Go Kart Belt, Comet 40/44 Series. Belt #40-140. Used in People Movers, Golf Carts, Mini-Bikes, and ATV's. Home > COMET INDUSTRIES BELTS > COMET 204331 (A-DF), Comet Industries belt replacement for 40/44 Series, 40-140 Go Kart belt. COMET 204331A - Replaces original Comet 40-140 for 40/44 Series. Go Cart Belt #204331. COMET 204331 (A-DF), Comet Industries belt replacement for 40/44 Series, 40-140 Go Kart belt. Comet 204331 (A-DF) Go Kart Belt. 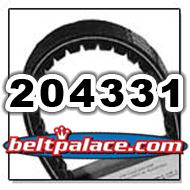 Replacement belt for Comet Industries 40/44 Series. COMET 204331 and 204331A. This Go Kart torque converter belt measures 7/8" (22mm) Top Width x 44-17/32” (1131mm) Length. Symmetric Cogged belt. For use with 40/44 Series. This Drive Belt is a common Go Cart belt, Golf Cart clutch belt, People Mover clutch belt, and Mini-Bike drive belt.